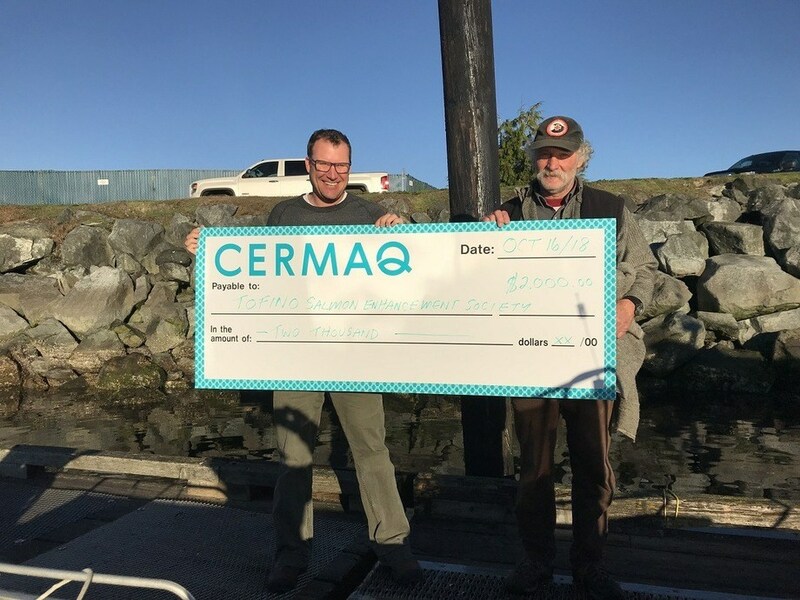 Cermaq Tofino area manager James Costello, left, presents a member of the Tofino Salmon Enhancement Society with a $2,000 donation. “We are supporting the overall UN's sustainable development goals. In particular, Cermaq is focusing on five of them. We can have a direct impact through our business model through who we are and what we are doing,” said Amy Jonsson, communications specialist at Cermaq Canada. “Cermaq can contribute by providing a healthy and sustainable protein source,” which supports the UN's goal of ending poverty. Responsible consumption and production is another goal Cermaq is working towards in 2019. “For us that means continuing to be a healthy protein source so we look through our value chain to see where we can be as sustainable as possible,” said Jonsson. “Moving forward we need to shift the way we supply food to the global food chain.That means looking at more sustainable sources. We will have a large role to play with that. Climate action is one of the UN's main development goals. “Our operations in general have a lower carbon footprint then other types of farming. We continue to support it through our operations,” said Jonsson. “Life below water, that' s where we can really contribute. We have partnerships with local organisations, First Nations and other grass roots organisations to help with shore line and ocean clean-up projects and restoring salmon habitats and also looking at partnering up to enhance salmon enhancement projects. "We are supporting the International Year of the Salmon,” added Jonsson. “We are looking to support beach clean-ups, connecting with local schools to make everyone aware that everything potentially ends up in the ocean. Let’s be careful about plastics and let’s reduce plastics. Clayoquot Sound is located on the west coast of Vancouver Island in British Columbia. Canada and the rest of the world adopted the 2030 Agenda for Sustainable Development and its 17 Sustainable Development Goals (SDGs) at the UN General Assembly in 2015. This universal plan of action aims to eradicate poverty, protect the planet and ensure prosperity in every country, including Canada.